The Mano de Dios amber mine is a hillside mine located in the Dominican Republic. The name means “Hand of God” in Spanish. 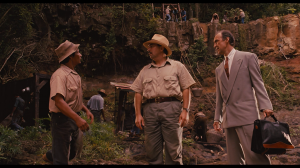 Mano de Dios was a contributory fossil site used by InGen to forward their plans for Jurassic Park; however, Dominican amber dates only to the Cenozoic period, and not to the Mesozoic, the Age of Dinosaurs. The mine’s chief excavator was Juanito Rostango. Rostango had planned to meet with John Hammond at the mine following the incident involving Jophrey, but Donald Gennaro was sent in his stead because Hammond decided to visit his daughter–who was going through a divorce–at the time. Dominican amber comes from the extinct leguminous tree called Hymenaea protera. It differs from Baltic amber in that it is almost always transparent, and has a higher number of fossil inclusions.